Eco Sound Medical Services is a strong supporter of safety in all that we do. 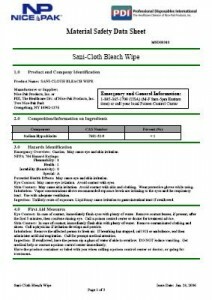 We have included some Material Safety Data sheet Information for our customers convenience and knowledge. Use of MSDS Online (free registration) allows you to search for data sheets by product name, manufacturer, CAS# and/or product code. You can also contact us directly with queries regarding MSDS for products we stock. For further information on specific chemicals, use the free chemical database.